Mutant Football League Dynasty Edition is the edition containing the so-called mode Dynasty (a kind of career mode) of the game Mutant Football League and with an additional team, or i New Goreleans Zombies. 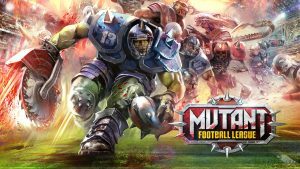 History of the historian Mutant League Footbal released in 1993 for Sega Megadrive, the title in question, in its being rather truculent light-hearted and kitsch, makes its way to the much more famous Madden. In fact, he succeeds in mimicking the latter's TV cut, with a lot of commentary, a technical commentary on the side (both full of foul language) post-race declarations and statistics. Graphic concept that goes from horror to post-apocalyptic passing through steampunk. The stadiums seem to be taken more from an online map of Quake than from a football match: they go from the alien running, rolling up, going through skeletons, orks tanned by Mad Max to improbable robots and werewolves. Fully armed. A gameplay quite a lot of arcade acts as a counterpart to a series of easily assimilable but very well thought out tactics. 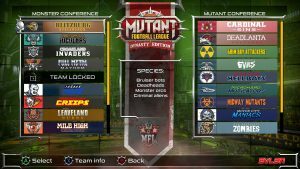 The key mapping remembers Madden, except for the speed button to push constantly to overcome opponents and arcana of scenery, it is easily accessible by anyone, given the very arcade nature of the game. 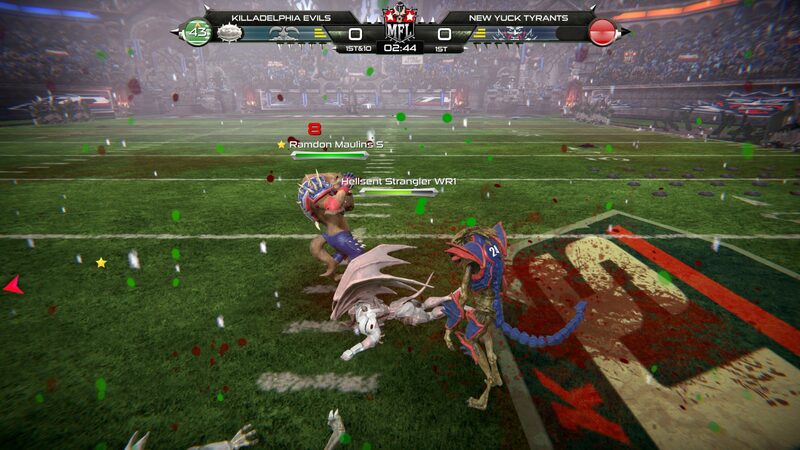 In Mutant Football League Dynasty Edition your walk in the field gets hindered by unexpected events such as: circular saws, lightning, volcanic craters e sharp bars. The easier you are to disengage with the oval ball, the more the game field's fatalities will wear you out yard after yard. You can cut up your opponents both in the game and in the tackles, with real fistfights to the death of the post point. The artificial intelligence of the adversaries leaves a lot to be desired above all if they will have to deal with the luciferini obstacles of which above. We come to the modalities. Play Now, or quick game: having chosen the team and the race settings, you dive into the oval ball also in local multiplayer, elbow grease to clean the screen from the impossible dirt of enemy blood and so on. The single player games in the long run turn out to be quite monotonous, especially if the unforeseen events are deactivated. Next we find the classic online mode, where you can play an 1 vs 1 match or enter a canonical room where you can play various and eventual tournaments or create your own. Quite amusing but only with the unexpected activated. The advent of the oval ball. Next we find the Dinasty mode which gives its name to this version of the game: a kind of career mode. From the rookie level to the Mayhem Bowl Champions Olympus, you play the coach or general manager, and thanks to the mode scouting you can find new talent. All quite monotonous and lacking in performance, as the players all have equal values ​​between them. 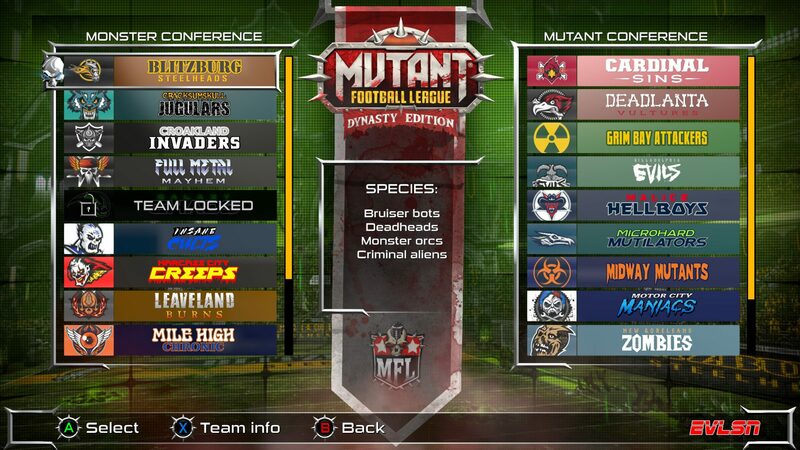 Then there is the so-called mode Game Modes which contains: training camp, practice, playoffs e season. In training camp mode you can work out using an interactive tutorial, achieving certain tactical and technical goals while in practice you can try offensive or defensive game situations. 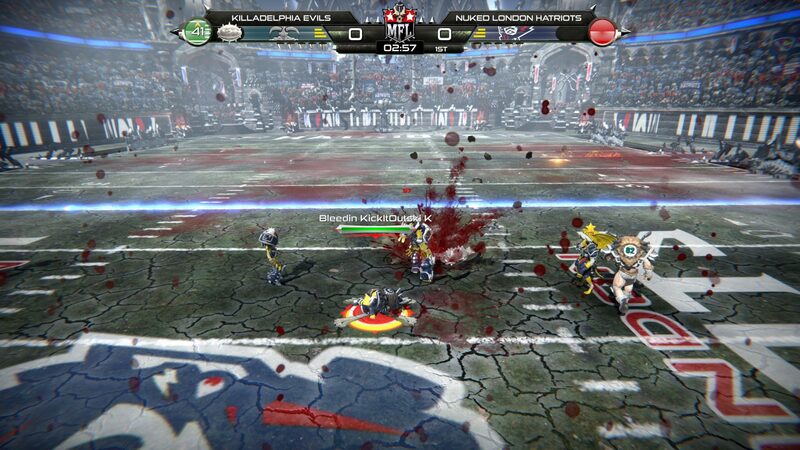 In Playoffs we face the playoff races, finally in Season 13 seasonal matches are waiting for you at the Mayhem Bowl. 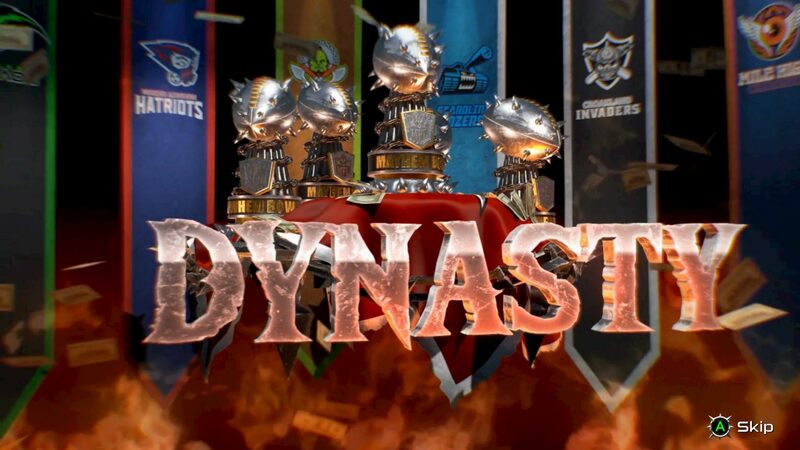 The Dynasty edition: the horrifying version of the Madden franchise mode. Yards to love, yards to hate. The frantic component of parody games that make the verse to more sports titles, see for example Grid o Rocket League to name a few, they make the frantic action their keystone. However, by definition, they do not have so many dead times. But the footbal is football you know, like it or not. Physical variables and boundary elements need excited and "interminable" actions and break the frenzy of the game, as a horrifying parody of a sport from the actual time of the game, which would not yield. At least for those who are not big fans of the oval ball, precisely. A product that can be enjoyed on average but maybe only on sale for just a few wedges, nothing more. Monsters or mutants: and which side are you on? Single mode very little intriguing, funny dynasty and discreetly engaging but quite an end in itself. The online instead, when and if you will play us seen the matchmatking, is the only modality worthy of note and that adds that quid in more in comparison to the others. Raw, bloody, forced e immediate. 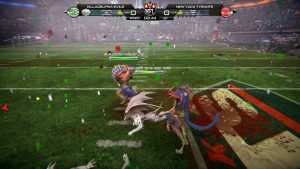 Among violent fights to the mortal kombat, lugubrious unforeseen events on the field, players passed to a better life (and resuscitated in Dynasty only with possible potions), the title of Digital Dreams, started as a project on Kickstarter 2 years ago, turns out to be still only half-engaging even if surrounded by somewhat fatal game mechanics for the sport in question. Funny in flashes, stereotyped and somewhat unsatisfactory: if del soccer, especially joystick in hand, he didn't give a damn, after a while la monotony will take over. 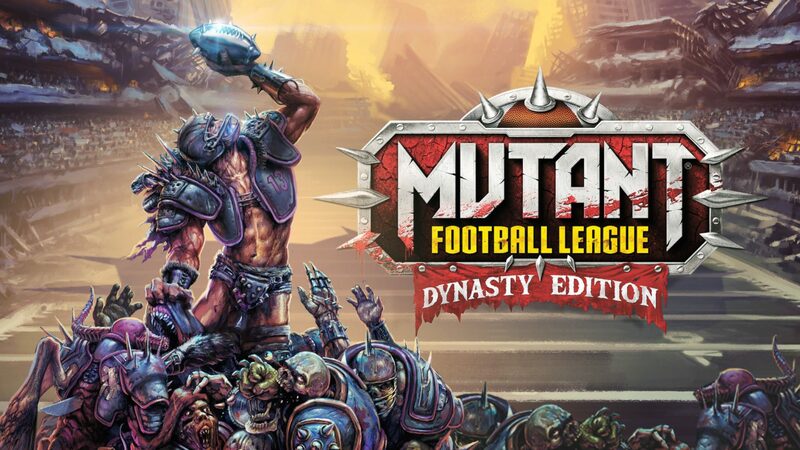 Mutant Football League Dynasty Edition came out the October 30 2018 for Pc, Ps4, Xbox One and Switch.